You try to be good, but the temptation to drown out the noise of parenthood with some great tunes is just too much to resist. The music washes over you, bringing you back to simpler times. But alas, once you plug in the kids started running amok, and now the house is on fire and there’s the cleaning up to do and all that paperwork. Maybe you should have tried modifying a baby monitor to interrupt your music in case of emergency? Starting with an off-the-shelf baby monitor, [Ben Heck] takes us through the design goals and does a quick teardown of the circuit. A simple audio switching circuit is breadboarded using an ADG436 dual SPDT chip to allow either the baby monitor audio or music fed from your favorite source through to the output. [Ben] wisely chose the path of least resistance to detecting baby noise by using the volume indicating LEDs on the monitor. A 555 one-shot trips for a few seconds when there’s enough noise, which switches the music off and lets you listen in on [Junior]. The nice touch is that all the added components fit nicely in the roomy case and are powered off the monitor’s supply. Maybe you’d prefer listening to the nippers less than watching them? In that case, this impromptu eye-in-the-sky baby camera might be a better choice. “Quick! We’re having a baby and we need a baby monitor!” Rather than run to the local big box and plunk down cash for an off-the-shelf solution, any self-respecting hacker would rise to the challenge and hit the shop to build something like this live streaming eye-in-the-sky baby camera. Right? At least that’s how [Antibore] handled the situation, and the results are pretty good. He designed his build around an old Raspberry Pi 2 that was hanging around. That required a WiFi adapter, and since he wanted video and audio he needed a camera and mic. The first USB mic had a nice compact design but didn’t perform well, so a gutted gooseneck mic soldered right to the USB connector joined the design spec. A camera module, cell-phone quick charge battery bank, and a 3D printed case round out the BOM. A knitted cozy to keep it looking warm and fuzzy was provided by the mother-to-be — although we think it looks a little like [Mike Wazowski]. This self-contained unit will work anywhere it has access to a WiFi network. Mounted on the baby carrier, it’ll provide a live stream to any browser and provide the new parents with a little peace of mind. There are a lot of baby monitors on the market, some of them terrible and in need of a rebuild. Kudos to [Antibore] for deciding to roll his own custom solution and for getting it done before the blessed event. Now how about painting that nursery? 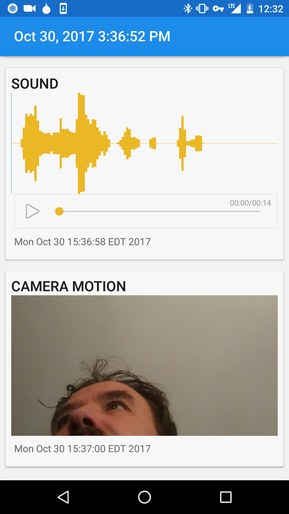 [Sven337]’s rebuild of a cheap and terrible baby monitor isn’t super visual, but it has so much more going on than it first seems. It’s also a how-to for streaming audio via UDP over WiFi with a pair of ESP8266 units, and includes a frank sharing of things that went wrong in the process and how they were addressed. [Sven337] even experimented with a couple of different methods for real-time compression of the transmitted audio data, for no other reason than the sake of doing things as well as they can reasonably be done without adding parts or spending extra money. 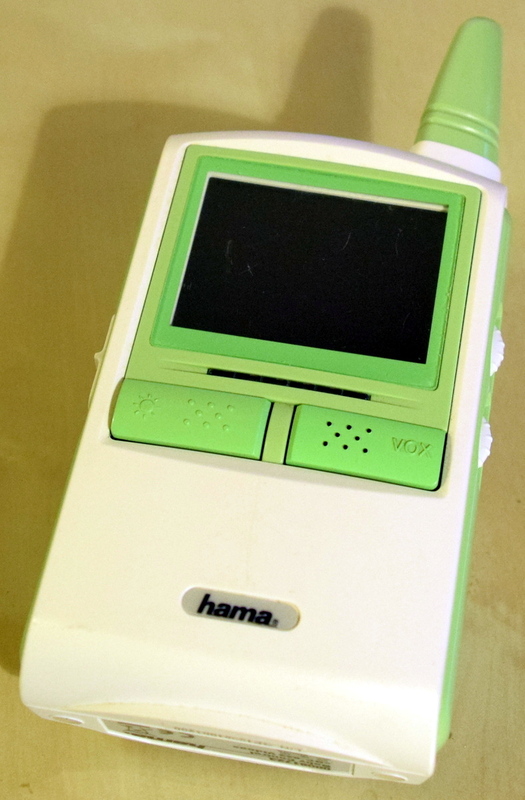 The original baby monitor had audio and video but was utterly useless for a number of reasons (French). The range and quality were terrible, and the audio was full of static and interference that was just as loud as anything the microphone actually picked up from the room. The user is left with two choices: either have white noise constantly coming through the receiver, or be unable to hear your child because you turned the volume down to get rid of the constant static. Our favorite part is the VOX “feature”: if the baby is quiet, it turns off the receiver’s screen; it has no effect whatsoever on the audio! As icing on the cake, the analog 2.4GHz transmitter interferes with the household WiFi when it transmits – which is all the time, because it’s always-on. Small wonder [Sven337] decided to go the DIY route. Instead of getting dumped in the trash, the unit got rebuilt almost from the ground-up. Editor’s Note: This was the last Fail of the Week tip we had stored up. If you want to see the series continue on a weekly basis we need help finding more documented fails! Please look back through your projects and document the ones that didn’t go quite right. We also encourage you to send in links to other fails you’ve found. Just drop the links in our tips line. Thanks! Now on with business. 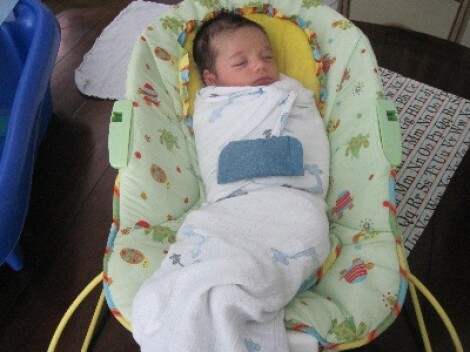 This is a baby monitor which [Eric] cleverly repaired, only to realize that he more than likely did it the hard way. The monitor was broken and went unused until his son figured out how to climb out of the crib, so he figured it was time to start monitoring again. Pulling the unit from the brink of the parts bin he set to work repairing the broken power connector. Further inspection of the power adapter showed that it was spec’d to put out 5V at 1A. 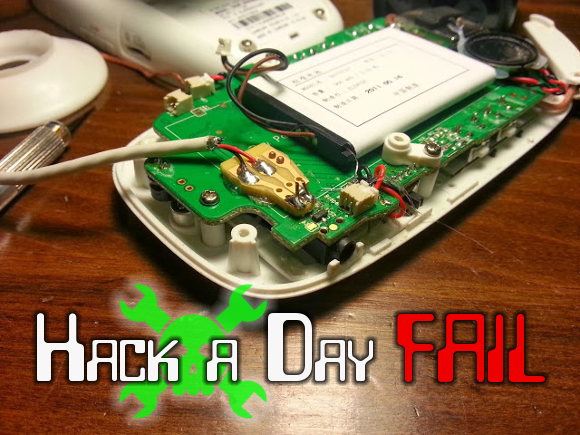 This falls in line with USB power, so he clipped the end off of a USB-B cable and used a hunk of proto-board to inject the 5V lines into the device. It was when it came time to reassemble the case that he flipped the board over and discovered an existing USB-B port. He could have just cut a hole in the case to get at the connector and plugged the un-altered cable in directly. Oh well… we’re sure it was fun figuring out his own custom solution!